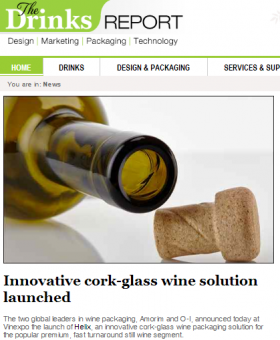 The two global leaders in wine packaging, Amorim and O-I, announced today at Vinexpo the launch of Helix, an innovative cork-glass wine packaging solution for the popular premium, fast turnaround still wine segment. As part of the development process, market research in France, UK, US and China revealed great consumer acceptance of Helix for fast turnaround and popular premium wines. In addition, consumers also appreciated retaining the festive ‘pop’ associated with opening a bottle of wine.